These decadent Carmelitas are sure to become a new favorite! A buttery oat cookie base is filled with a layer of chocolate chips and caramel then they're finished with sea salt. Trust me, these are so delicious! Preheat oven to 350 degrees. Pour cream over caramels in a microwave safe bowl, heat mixture on HIGH power in 30 second intervals, stirring well after each interval until melted and smooth (alternately you can combine the two ingredients in a saucepan and melt over low heat), set aside. In a mixing bowl whisk together flour, oats, brown sugar, baking soda and 1/4 tsp table salt. Place butter in a microwave safe bowl and heat butter in microwave until melted. Stir vanilla extract into melted butter then pour mixture over dry ingredients. Using a fork, stir well to evenly coat. Press half of the oat mixture evenly into the bottom of a buttered 8 by 8-inch baking dish (layer will be thin) then bake in preheated oven for 10 minutes. Remove from oven and sprinkle milk chocolate and semi-sweet chocolate chips into an even layer over baked cookie crust, then pour caramel mixture evenly over chocolate chip layer. 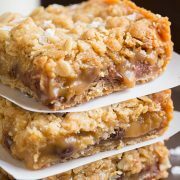 Sprinkle a scant 1/2 tsp flaky sea salt evenly over caramel layer (or you can sprinkle it over the top of the last crumble layer before baking), then sprinkle top evenly with remaining oat mixture. Bake in preheated oven 16 - 20 minutes until lightly golden. Cool completely on a wire rack (it will take a few hours. To speed up the cooling you can chill in refrigerator). Store in an airtight container in a single layer.